I’ll see you back here lupine Monday (assuming the wolves haven’t enticed me to continue with my singing lessons and relocate). Hopefully enough moon glow will have landed in my soul by then. This entry was posted in Can't put Anywhere Else, My Art & Writing and tagged art, blogging, endangered species, followers, friends, humor, illutration, relationships, Summer, thoughts, vacation, writing. Bookmark the permalink. Amazing Annmarie! You rock! I love the wolf! I have a t-shirt with the same wolf on my t-shirt. It’s an NWO Wolfpac shirt red color. no i dont think so. just looks like a similar wolf. Awesome name for a dog Rocky. Like ‘Rocky Balboa’. maybe ill have dogs one day as pets for now i am a cat man but i can also be both. I want a big dog. My Uncle had a dog Chance who was big I use to pick him up he was huge and heavy. Then I would throw him the tennis ball and we would play. He was a fun dog. 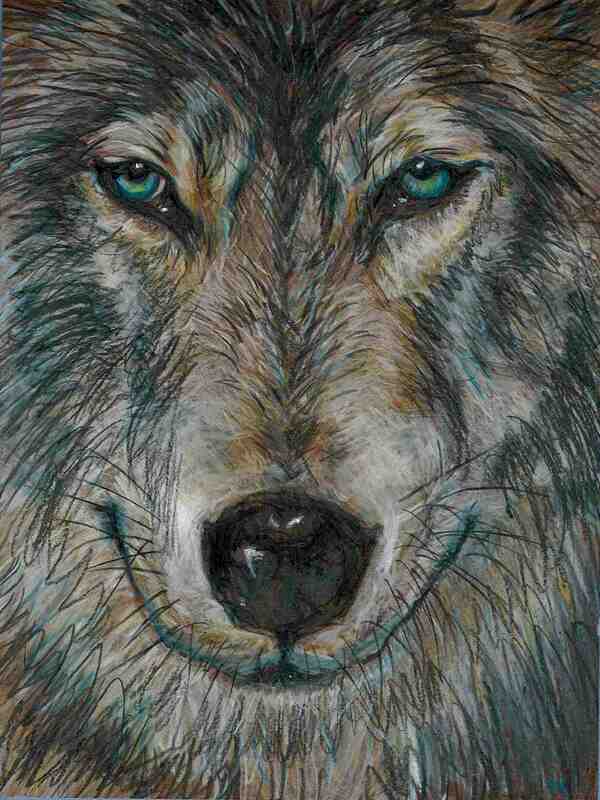 Love the Wolf! Squirrel scares me but I very much appreciate the philosophy! I’m under time constraints so I’ll have to go thespian and frolic all at once. Not very exciting – I had a 2-day garage sale and was in dire need of a WP break. Oh I did not know what this stuff was all about! But I Googled and got it, then! Hey, the wolf’s a masterpiece-I mean, just look! I really thought that was a real photo! And secondly, the suirrel: Is it supposed to be scary? It’s quite funny on the other side! Awesome as you always are, Miss AnnMarie! You are sweet as always, young man. Thank you. Miss AnnMarie, much obliged. I don’t think you’r drawings are Silly, I mean OKAY they get crazy at times (psst: the squirrel) and kinda “Drive me crazy” too, umm…spooky too, but they’re not in any way silly, Dear. You know something, Miss AnnMarie? You probably know me a lot more than others do now! Yes, I like to be funny, just to bring out the smile on someone’s lips! Turquoise eyes is so beautiful! Who are you and what have you done with Ann? You gave me a chuckle upon returning to my computer chair in ye old studio. I hope you are feeling well, my friend.